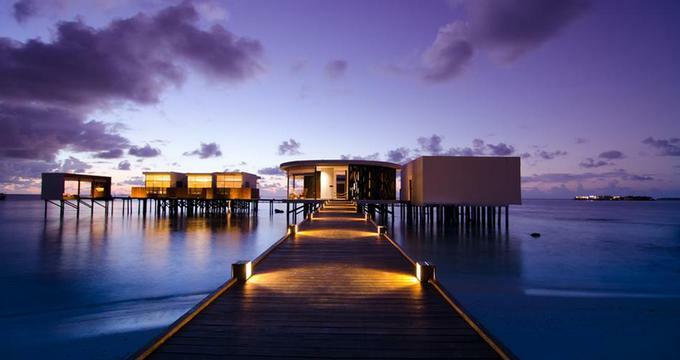 These incredible spas in the Maldives all have a wow factor because of their stunning overwater architecture. Get an open-air massage over the water and relax in an enclosed overwater room with a glass floor so that you can look down into the lagoon. Some of these wellness centers offer beach and garden treatments in addition to their overwater treatment rooms. One of them, Lime Spa at Huvafen Fushi, even has a surreal underwater treatment rooms where you can get a massage with tropical fish swimming all around you. Once you are done looking at the photos of these stunning getaways, you may also like: 23 Spas With the Most Spectacular Ocean Views and 25 Best Luxury Spa Vacations. Gili LankanFushi has overwater couples' massage rooms with a spacious private outdoor deck and side-by-side tables surrounded by ocean views. 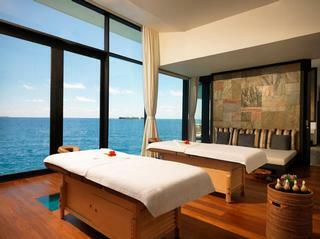 Enjoy panoramic views while receiving your massage and after the treatment. 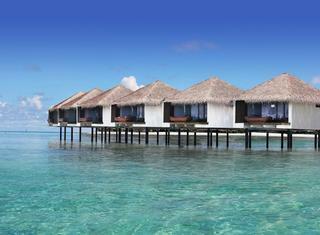 Guests can choose from several types of luxury accommodations at the Gili Lankanfushi Resort. Couples will feel right at home in a spacious over-the-water villa suite while families can enjoy added space in a residence villa. For the ultimate experience guests can stay in the private reserve, which is known as the largest over-the-water villa on Earth. At Gili Lankanfushi's Meera Spa, guests can unwind with a bamboo massage, ocean therapy, or a trip to the luxurious sauna. Activities at the resort include snorkeling, diving, surfing, canoeing, sunset cruises, and more. At the end of a long day the resort puts on movies for guests to watch at the comfortable outdoor cinema. Taj Exotica offers contemporary therapies combined with ancient Indian wisdom, including Indian aromatherapy massages, yoga and meditation. If you want to experience the Indian bathing ritual of Alepa, check into this amazing wellness center. 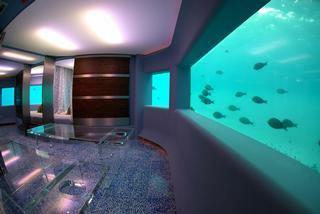 LIME Spa at Huvafen Fushi Maldives is located under water. Treatment rooms have large windows through which you can look into the surrounding lagoon. Anantara Spa at Anantara Kihavah Villas has six private overwater treatment rooms that can be reached via a jetty from the sandy beach. Couples should try one of the two double overwater Thai massage salas. Located at the foot of Hanifaru Bay, the Anantara Kihavah Maldives is a collection of 79 villas and bungalows that rest on top of the Maldivian Sea. Each villa comes with a spacious private pool. The resort is known for its unique quartet of restaurant: Sea, Fire, Salt, and Sky. At the Sky restaurant, guests dine on fine cuisine in a protected bubble that is surrounded by the life-filled Indian Ocean. To stay healthy guests can pay a visit to the resort's fitness center or catch a game at the tennis, badminton, or volleyball courts. A cooking school, children's club, and dive center are also located on the property. Velassaru Maldives has been features in our collection of 18 Most Beautiful Spa Baths and Pools because of its stunning overwater hydropool. There are 10 overwater treatment rooms, a relaxation room, steam room and a manicure and pedicure room. Velassaru Maldives has a collection of villas and bungalows that provide stunning views of the turquoise ocean and white-sand beach. For dining guests can choose from eight unique restaurants and bars that are just steps away from the guest accommodations. An onsite spa, PADI-certified dive shop, and a marine center are also situated on the property. For entertainment, guests can go on a yacht excursion, take a tour of Male, join a nighttime fishing trip, or search for dolphins out at sea. All of Velassaru's excursions can be done as part of a group or enjoyed as a private tour. 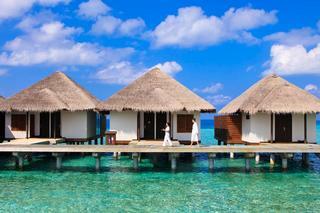 Work out in an overwater fitness center at the Viceroy Maldives and and get a massage on stilts. Five of the seven over-water villas have private changing areas, steam showers and private deck views. 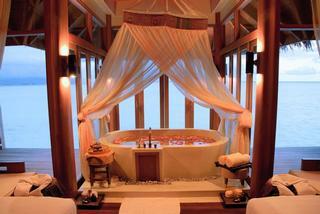 The villas are equipped with two massage tables and can accommodate side-by-side couples' massages. The wellness center by Clarins at The Residence Maldives is comprised of six overwater treatment rooms connected to the island via a jetty. Enjoy sounds of the ocean and incredible views from the treatment rooms at the COMO Shambhala Retreat at Maalifushi by Como. 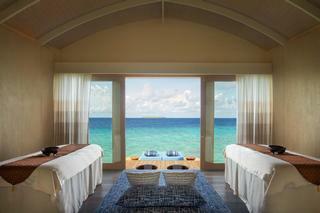 Eight overwater treatment rooms were built to offer the best Indian Ocean views. Smaller than most of its counterparts, the Cocoa Island Resort is the ideal place for a romantic getaway. The resort is comprised of 33 over-the-water suites and villas. 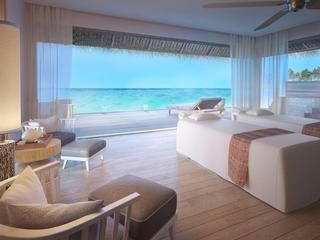 Each room has a private terrace that provides easy access to the bright Maldivian Sea. Dining options at the resort include a selection of traditional Maldivian fare as well as international cuisine. Snacks, cocktails, and healthy juices are available for purchase throughout the day. Activities at Cocoa Island include snorkeling, sunrise and sunset yoga classes, dolphin-watching trips, cooking demonstrations, and parasailing. The resort also has a spa where guests can indulge in a variety of holistic treatments. 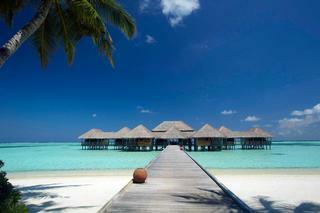 Coco Bodu Hithi Maldives has treatment rooms and a fitness center built over the blue lagoon. Jumeirah Dhevanafushi is a spectacular facility with overwater treatment rooms, including a couples' room with a large round tub in the center where you can relax and rejuvenate with a view of the Indian Ocean. The Jumeirah Dhevanafushi is part of the Jumeirah hotel brand, which is known for operating the world's only seven-star hotel in Dubai. The Maldives Dhevanfushi resort boasts a beautiful collection of over-the-water bungalows, a holistic spa, and a gymnasium that offers panoramic views of the Indian Ocean. For meals, guests can enjoy a romantic sunset dinner on the resort's private beach. Afternoons at the resort are spent diving, snorkeling, taking culinary classes, going fishing, or participating in yoga or fitness classes. The Jumeirah Dhevanfushi is also a popular destination for weddings, corporate retreats, and other special events. 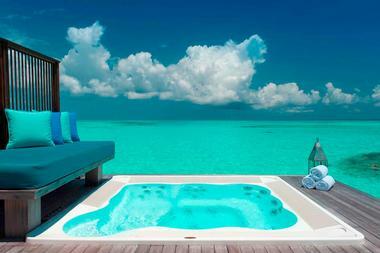 The treatment rooms at Anantara Dhigu have romantic oversized tubs which face the ocean. You can close the privacy curtain or leave it open and enjoy the view. 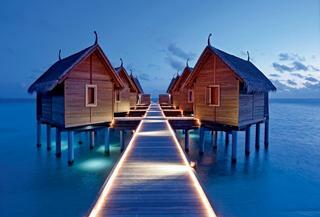 Located in the South Male Atoll of the Maldives, the Anantara Dhigu Maldives Resort consists of 110 luxury villas. 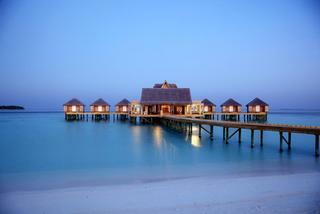 Guests can stay in an over-the-water villa or a villa directly on the beach. For entertainment, visitors can join a speedboat trip to a nearby island, snorkel in the crystal clear waters that surround the resort, swim in the resort's infinity pool, visit the gym, or enjoy a treatment at the onsite spa. 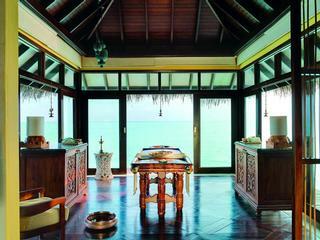 Anantara Dhigu also has a game room, several sports courts, and a cooking school. Adventure seekers can participate in parasailing, diving, snorkeling, kite surfing, and more just minutes away from the resort. Constance Moofushi is a private oasis set on stilts over the blue lagoon. Book a sunset massage and you'll be treated to a beautiful display of colors over the ocean. Listen to the sounds of the ocean while getting a massage in this amazing overwater treatment pavilion at Chi Spa, Shangri-La Villingili. 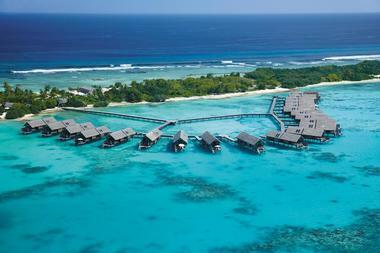 This opulent resort is located on its own private island just an hour away from the Male International Airport. Designed with romance in mind, the resort features over-the-water bungalows, pristine beaches, and breathtaking views of the Indian Ocean. Guests can visit the equator on a luxury yacht, play some golf at the resort's private golf course, or indulge in relaxing treatments at the onsite spa. Dinner is a special event at the Shangri-La. Guests can enjoy a delectable meal on the beach or dine in the comfort of their private villa. Lastly, visitors can take advantage of other special extras like the resort's business center and childcare services. The wellness retreat at Conrad Maldives Rangali Island is built on stilts over the lagoon, offering vacationers spectacular views and calm ambiance. The wellness center specializes in holistic treatments for singles and couples.